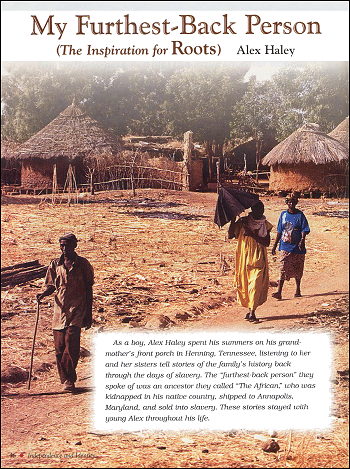 Alex Haley’s Roots: The Saga of an American Family encouraged black Americans to explore their past and helped to popularize oral and family history in the United States. His writing reminds us that oral history recording taps into a vast, rich reservoir of oral traditions sustained through family, community and national memories. These stories stayed with young Alex throughout his life. And he became obsessed with finding his family’s roots in Africa. With the help of some friends and a linguist from West Africa, he learned that some of the words in his grandmother’s stories were like Mandinka words (a language spoken by some tribes), and that the river she spoke of as ‘Kamby Bolong’ was probably the Gambia River. Alex knew that he must get to the Gambia River. With the help of Gambian officials, he learned that a griot, or oral historian, knew the history of a Kin-tay family. Could this be his own family? Alex Haley began his own trip up the Gambia River to find out. My Grandma Cynthia Murray Palmer lived in Henning, Tenn. (pop. 500), about 50 miles north of Memphis. Each summer as I grew up there, we would be visited by several women relatives who were mostly around Grandma’s age, such as my Great Aunt Liz Murray who taught in Oklahoma, and Great Aunt Till Merriwether from Jackson, Tenn., or their considerably younger niece, Cousin Georgia Anderson from Kansas City, Kan., and some others. Always after the supper dishes had been washed, they would go out to take seats and talk in the rocking chairs on the front porch, and I would scrunch down, listening, behind Grandma’s squeaky chair, with the dusk deepening into the night and the lightning bugs flicking on and off above the now shadowy honeysuckles. Most often they talked about our family—the story had been passed down for generations—until the whistling blur of lights of the southbound Panama Limited train whooshing through Henning at 9:05 P.M. signaled our bedtime. So much of their talking of people, places and events I didn’t understand: For instance, what was an “Ol’ Massa,” an “Ol’ Missus” or a “plantation”? But early I gathered that white folks had done lots of bad thing to our folks, though I couldn’t figure out why. I guessed that all they talked about had happened a long time ago, as now or then Grandma or another, speaking of someone in the past, would excitedly thrust a finger toward me, exclaiming, “Wasn’t big as this young ‘un!” And it would astound me that anyone as old and grey-haired as they could relate to my age. But in time my head began both a recording and picturing of the more graphic scenes they would describe, just as I also visualized David killing Goliath with his slingshot, Old Pharaoh’s army drowning, Noah and his ark, Jesus feeding that big multitude with nothing but five loaves and two fishes, and other wonders that I heard in my Sunday school lessons at our New Hope Methodist Church. Crippling about, working in “Mas’ William’s” house and yard, the African in time met and mated with “the big house cook named Bell,” and there was born a girl named Kizzy. As she grew up her African daddy often showed her different kinds of things, telling her what they were in his native tongue. Pointing at a banjo, for example, the African uttered, “ko”; or pointing at a river near the plantation, he would say, “Kamby Bolong.” Many of his strange words started with a “k” sound, and the little, growing Kizzy learned gradually that they identified different things. When addressed by other slaves as “Toby,” the master’s name for him, the African said angrily that his name was “Kin-tay.” And as he gradually learned English, he told young Kizzy some things about himself—for instance, that he was not far from his village, chopping wood to make himself a drum, when four men had surprised, overwhelmed, and kidnaped him. So Kizzy’s head held much about her African daddy when at age 16 she was sold away onto a much smaller plantation in North Carolina. Her new “Mas’ Tom Lea” fathered her first child, a boy she named George. And Kizzy told her boy all about his African grandfather. George grew up to be such a gamecock fighter that he was called “Chicken George,” and people would come from all over and “bet big money” on his cockfights. He mated with Matilda, another of Lea’s slaves; they had seven children, and he told them the stories and strange sounds of their African great-grandfather. And one of those children, Tom, became a blacksmith who was bought away by a “Mas’ Murray” for his tobacco plantation in Alamance County, N.C.
Tom mated there with Irene, a weaver on the plantation. She also bore seven children, and Tom now told them all about their African great-great-grandfather, the faithfully passed-down knowledge of his sounds and stories having become by now the family’s prideful treasure. The youngest of that second set of seven children was a girl, Cynthia, who became my maternal Grandma (which today I can only see as fated). Anyway, all of this is how I was growing up in Henning at Grandma’s, listening from behind her rocking chair as she and the other visiting old women talked of that African (never then comprehended as my great-great-great-great-grandfather) who said his name was “Kin-tay,” and said “ko” for banjo, “Kamby Bolong” for river, and a jumble of other “k”-beginning sounds that Grandma privately muttered, most often while making beds or cooking, and who also said that near his village he was kidnaped while chopping wood to make himself a drum. The story had become nearly as fixed in my head as in Grandma’s by the time Dad and Mama moved me and my two younger brothers, George and Julius, away from Henning to be with them at the small black agricultural and mechanical college in Normal, Ala., where Dad taught. Then one Saturday in 1965 I happened to be walking past the National Archives building in Washington. Across the interim years I had thought of Grandma’s old stories—otherwise I can’t think what diverted me up the Archives’ steps. And when a main reading room desk attendant asked if he could help me, I wouldn’t have dreamed of admitting to him some curiosity hanging on from boyhood about my slave forebears. I kind of bumbled that I was interested in census records of Alamance County, North Carolina, just after the Civil War. The microfilm rolls were delivered, and I turned them through the machine with a building sense of intrigue, viewing in different census takers’ penmanship an endless parade of names. After about a dozen microfilmed rolls, I was beginning to tire, when in utter astonishment I looked upon the names of Grandma’s parents: Tom Murray, Irene Murray . . . older sisters of Grandma’s as well—every one of them a name that I’d heard countless times on her front porch. It wasn’t that I hadn’t believed Grandma. You just didn’t not believe my Grandma. It was simply so uncanny actually seeing those names in print and in official U.S. Government records. That week I flew to London on a magazine assignment. Since by now I was steeped in the old, in the past, scarcely a tour guide missed me—I was awed at so many historical places and treasures I’d heard of and read of. I came upon the Rosetta stone in the British Museum, marveling anew at how Jean Champollion, the French archaeologist, had miraculously deciphered its ancient demotic and hieroglyphic texts . . . The thrill of that just kept hanging around in my head. I was on a jet returning to New York when a thought hit me. Those strange, unknown-tongue sounds, always part of our family’s old story . . . they were obviously bits of our original African “Kin-tay’s” native tongue. What specific tongue? Could I somehow find out? Back in New York, I began making visits to the United Nations Headquarters lobby; it wasn’t hard to spot Africans. I’d stop any I could, asking if my bits of phonetic sounds held any meaning for them. A couple of dozen Africans quickly looked at me, listened, and took off—understandably dubious about some Tennesseean’s accent alleging “African” sounds. I’d never heard of any “Mandinka.” Grandma just told of the African saying “ko” for banjo, or “Kamby Bolong” for a Virginia river. Dr. Vansina telephoned an eminent Africanist colleague, Dr. Philip Curtin. He said that the phonetic “Kin-tay” was correctly spelled “Kinte,” a very old clan that had originated in Old Mali. The Kinte men traditionally were blacksmiths, and the women were potters and weavers. I knew I must get to the Gambia River. The first native Gambian I could locate in the U.S. was named Ebou Manga, then a junior attending Hamilton College in upstate Clinton, N.Y. He and I flew to Dakar, Senegal, then took a smaller plane to Yundum Airport, and rode in a van to Gambia’s capital, Bathurst. Ebou and his father assembled eight Gambia government officials. I told them Grandma’s stories, every detail I could remember, as they listened intently, then reacted. “ ’Kamby Bolong’ of course is Gambia River!” I heard. “But more clue is your forefather’s saying his name was ‘Kinte.’ ” Then they told me something I would never ever have fantasized—that in places in the back country lived very old men, commonly called griots, who could tell centuries of the histories of certain very old family clans. As for Kintes, they pointed out to me on a map some family villages, Kinte-Kundah, and Kinte-Kundah Janneh-Ya, for instance. The Gambian officials said they would try to help me. I returned to New York dazed. It is embarrassing to me now, but despite Grandma’s stories, I’d never been concerned much with Africa, and I had the routine images of African people living mostly in exotic jungles. But a compulsion now laid hold of me to learn all I could, and I began devouring books about Africa, especially about the slave trade. Then one Thursday’s mail contained a letter from one of the Gambian officials, inviting me to return there. Monday I was back in Bathurst. It galvanized me when the officials said that a griot had been located who told the Kinte clan history—his name was Kebba Kanga Fofana. To reach him, I discovered, required a modified safari: renting a launch to get upriver, two land vehicles to carry supplies by a roundabout land route, and employing finally 14 people, including three interpreters and four musicians, since a griot would not speak the revered clan histories without background music. The boat Baddibu vibrated upriver, with me acutely tense: Were these Africans maybe viewing me as but another of the pith-helmets? After about two hours, we put in at James Island, for me to see the ruins of the once British-operated James Fort. Here two centuries of slave ships had loaded thousands of cargoes of Gambian tribespeople. The crumbling stones, the deeply oxidized swivel cannon, even some remnant links of chain seemed all but impossible to believe. Then we continued upriver to the left-bank village of Albreda, and there put ashore to continue on foot to Juffure, village of the griot. Once more we stopped, for me to see toubob kolong, the “white man’s well,” now almost filled in, in a swampy area with abundant, tall, saw-toothed grass. It was dug two centuries ago to “17 men’s height deep” to insure survival drinking water for long-driven, famishing coffles of slaves. Walking on, I kept wishing that Grandma could hear how her stories had led me to the “Kamby Bolong.” (Our surviving storyteller Cousin Georgia died in a Kansas City hospital during this same morning, I would learn later.) Finally, Juffure village’s playing children, sighting us, flashed an alert. The 70-odd people came rushing from their circular, thatch-roofed, mud-walled huts, with goats bounding up and about, and parrots squawking from up in the palms. I sensed him in advance somehow, the small man amid them, wearing a pillbox cap and an off-white robe—the griot. Then the interpreters went to him, as the villagers thronged around me. And it hit me like a gale wind: every one of them, the whole crowd, was jet black. An enormous sense of guilt swept me—a sense of being some kind of hybrid . . . a sense of being impure among the pure. It was an awful sensation. The old griot stepped away from my interpreters and the crowd quickly swarmed around him—all of them buzzing. An interpreter named A. B. C. Salla came to me; he whispered: “Why they stare at you so, they have never seen here a black American.” And that hit me: I was symbolizing for them twenty-five millions of us they had never seen. What did they think of me—of us? I suppose I physically wavered, and they thought it was the heat; rustling whispers went through the crowd, and a man brought me a low stool. Now the whispering hushed—the musicians had softly begun playing kora and balafon, and a canvas sling lawn seat was taken by the griot, Kebba Kanga Fofana, aged 73 “rains” (one rainy season each year). He seemed to gather himself into a physical rigidity, and he began speaking the Kinte clan’s ancestral oral history; it came rolling from his mouth across the next hours . . . 17th- and 18th-century Kinte lineage details, predominantly what men took wives; the children they “begot,” in the order of their births; those children’s mates and children. The three sons became men in Juffure. Janneh and Saloum went off and found a new village, Kinte-Kundah Janneh-Ya. “And then Omoro, the youngest son, when he had 30 rains, took as a wife a maiden, Binta Kebba. Sometimes, a “begotten,” after his naming, would be accompanied by some later-occurring detail, perhaps as “. . . in time of big water (flood), he slew a water buffalo.” Having named those four sons, now the griot stated such a detail. Goose-pimples the size of lemons seemed to pop all over me. In my knapsack were my cumulative notebooks, the first of them including how in my boyhood, my Grandma, Cousin Georgia and the others told of the African “Kin-tay” who always said he was kidnapped near his village—while chopping wood to make a drum . . . I showed the interpreter, he showed and told the griot, who excitedly told the people; they grew very agitated. Abruptly then they formed a human ring, encircling me, dancing and chanting. Perhaps a dozen of the women carrying their infant babies rushed in toward me, thrusting the infants into my arms conveying, I would later learn, “the laying on of hands . . . through this flesh which is us, we are you, and you are us.” The men hurried me into their mosque, their Arabic praying later being translated outside: “Thanks be to Allah for returning the long lost from among us.” Direct descendants of Kunta Kinte’s blood brothers were hastened, some of them from nearby villages, for a family portrait to be taken with me, surrounded by actual ancestral sixth cousins. More symbolic acts filled the remaining day. Let me tell you something: I am a man. But I remember the sob surging up from my feet, flinging up my hands before my face and bawling as I had not done since I was a baby . . . the jet-black Africans were jostling, staring . . . I didn’t care, with the feelings surging. If you really knew the odyssey of us millions of black Americans, if you really knew how we came in the seeds of our forefathers, captured, driven, beaten, inspected, bought, branded, chained in foul ships, if you really knew, you needed weeping . . .
Back home, I knew that what I must write, really, was our black saga, where any individual’s past is the essence of the millions’. Now flat broke, I went to some editors I knew, describing the Gambian miracle, and my desire to pursue the research; Doubleday contracted to publish, and Reader’s Digest to condense the projected book; then I had advances to travel further. What ship brought Kinte to Grandma’s “ ’Naplis” (Annapolis, Md., obviously)? The old griot’s time reference to “king’s soldiers” sent me flying to London. Feverish searching at last identified, in British Parliament records. “Colonel O’Hare’s Forces,” dispatched in mid-1767 to protect the then British-held James Fort whose ruins I’d visited. So Kunta Kinte was down in some ship probably sailing later that summer from the Gambia River to Annapolis. That night I recrossed the Atlantic. In the Library of Congress the Lord Ligonier’s arrival was one brief line in “Shipping In The Port Of Annapolis—1748-1775.” I located the author, Vaughan W. Brown, in his Baltimore brokerage office. He drove to Historic Annapolis, the city’s historical society, and found me further documentation of her arrival on Sept. 29, 1767. (Exactly two centuries later, Sept. 29, 1967, standing, staring seaward from an Annapolis pier, again I knew tears). More help came in the Maryland Hall of Records. Archivist Phebe Jacobsen found the Lord Ligonier’s arriving customs declaration listing, “98 Negroes”—so in her 86-day crossing, 42 Gambians had died, one among the survivors being 16-year-old Kunta Kinte. Then the microfilmed Oct. 1, 1767, Maryland Gazette contained, on page two, an announcement to prospective buyers from the ship’s agents, Daniel of St. Thos. Jenifer and John Ridout (the Governor’s secretary): “from the River GAMBIA, in AFRICA . . . a cargo of choice, healthy SLAVES . . .” ~ Alex Haley.